Gyles Brandreth, who provided the Introduction to the book. The reappraisal of Wilde as a thinker and moralist (a conclusion reached in my piece Finding Oscar) has been alive in Wilde scholarship for some time. The arrival of this volume now recognizes the popular appeal of this idea by providing a primer for those whose knowledge of Wilde is perhaps limited to his epigrams and major works. As such, this is not a book prepared by or for academia, something most would welcome while still desiring a degree of scholarship. And in this respect there are notes, but not many. Indeed, the publishers appear to sense this lack by offering the explanation that notes are sparse so as to “avoid interrupting the flow of Wilde’s prose”. They need not have been so self-conscious. The book is a reader not a reference. 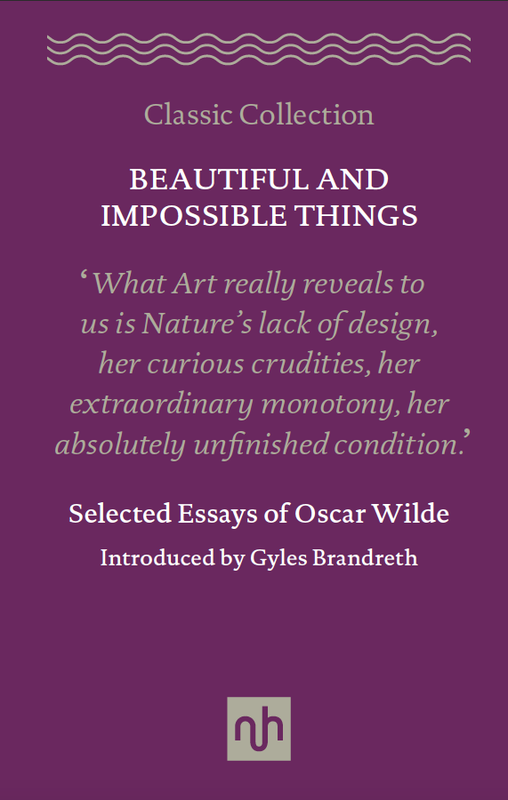 And, as a reader, it is a well-chosen selection that showcases Wilde’s eclecticism, from pithy one-liners to prison life; from domestic decoration, life and literature, to stagecraft and socialism; from the arts and America to Lyceum and Mahaffy, London and Models. If you have never read Wilde on these topics I heartily recommended you start with this book. But make sure you get the hardback. It a wonderful thing as an object. In sum, and to strain this purple prose to post-Dorian proportions I should say: it is book that should always be with us when there are no flowers to look at and we want something to stir the intelligence. Besides, leaving aside the beautiful and impossible things, who could not love a book that has red page numbers? Wilde’s stage direction: [Enter Mrs. Cheveley] She is in heliotrope, with diamonds…and makes great demands on one’s curiosity… A work of art, on the whole, but showing the influence of too many schools. (An Ideal Husband). The book sounds like a splendid travel companion. The kind that enhance the finer senses. Thanks for the great review.